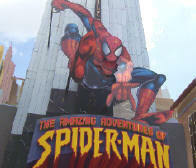 Marvel Super Hero Island: Incredible Hulk Coaster, Doctor Doom's Fearfall, Storm Force Accelatron and The Amazing Adventures of Spider-Man 3D thrill ride. Toon Lagoon: Dudley Do-Right's Ripsaw Falls flume ride and Popeye and Bluto's Bilge Rat Barges. Jurassic Park: Pteranodon Flyers roller coaster and Jurassic Park River Adventure. The Lost Continent: Dueling Dragons roller coasters, The Eighth Voyage of Sinbad and Poseidon's Fury. Suess Landing: The High in the Sky Suess Trolley Train Ride, The Cat in the Hat and Caro-Suess-El. Throughout Universal’s Islands of Adventure, you’ll have the chance to interact and take pictures with some of your favorite characters -- Spider-Man and other Marvel Super Heroes, Dr. Seuss’ Cat In The Hat, Merlin the Magician, Popeye, Bluto, Olive Oyl and more. Check the park map on the day of your visit as characters, locations, and times vary.